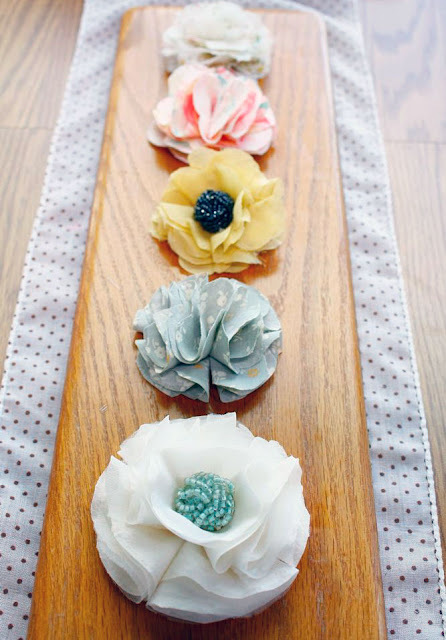 The instruction calls for floral paper punch (a Martha Stewart one, to be specific :P), but I think once the fabric is stiffened it would be easy to just hand cut these, no? How‐to on the Martha website. 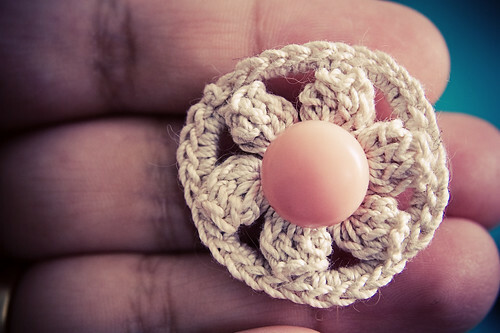 A dainty flower brooch made from crocheting thread. Simple and sweet. Pattern by Goodknits. 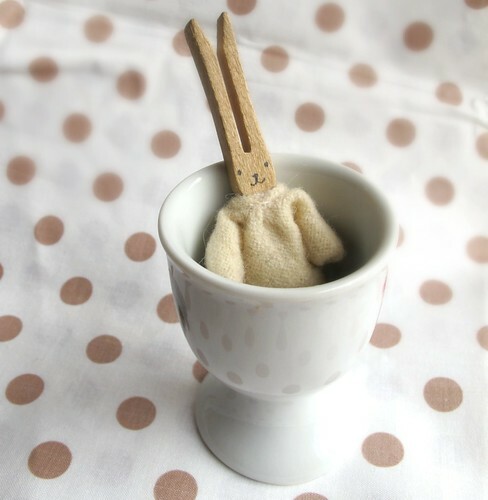 Also sweet is this clothes pin bunny. Tutorial from Maya Made. Another brilliant use of everyday object — cork characters! 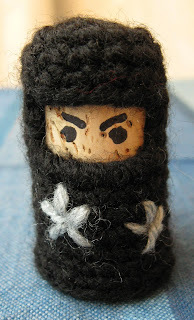 I especially love this ninja, but there are also patterns for a gnome and a knight. I can see the potential of making a whole series of outfits for the cork guys! I’m not a wine‐drinker, but I have friends who appreciate a glass of red with the beef from time to time. I need to visit them more often. Patterns generously shared by Lucy Ravenscar. A whale for hire! To store your headphones and keep them clean and safe! It’s such an awesome design it’s definitely worth more than the $3 download fee! If you prefer crocheting, like me (that’s because I can’t knit very well… but that’s another story), there’s a crochet version of the whale too! On Roman Sock. How awesome are these? 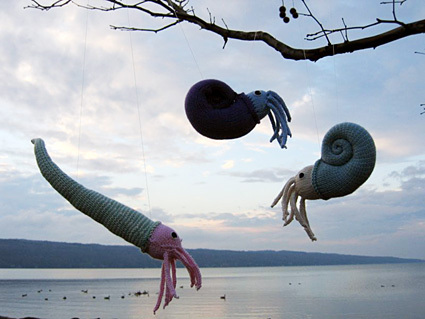 Knitted nautilus! When I was a kid I went through this phase of obsession with fossils and prehistoric creatures (ok, I still let out a not‐so‐subtle squeal when I find rocks with fossils at the beach). I once wanted to become an archeologist (ok, I still wish I were an archeologist). So, all that is to say that these belong on my couch. Pattern is free on Knitty, so all I need now is better knitting skills. Saw this on Whip Up, which features a nice review on the book Puppet Play, where this cat puppet comes from. The cat puppet tutorial is a sample project, made with a sweater sleeve, a scarf, or a leg warmer. I’ve always wondered whether beets would make a good dyeing, painting, or printing material, because it stains absolutely everything (especially the white chopping board). These lovely beet prints are from My Little Hen. These really remind me of the legendary turducken. 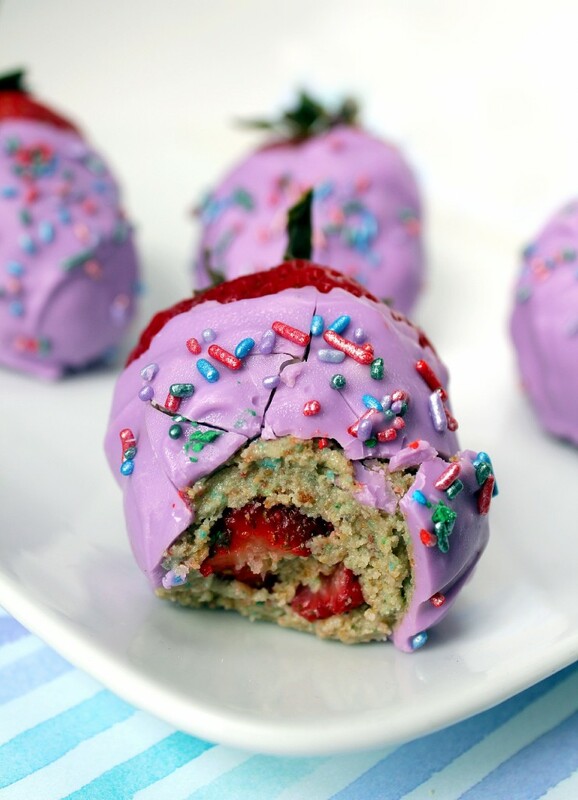 It’s a strawberry, stuffed with cake, and covered in thick layer of chocolate. Though they are definitely more appealing (to me, anyway) than the turducken. A very detailed tutorial on 1 Fine Cookie. 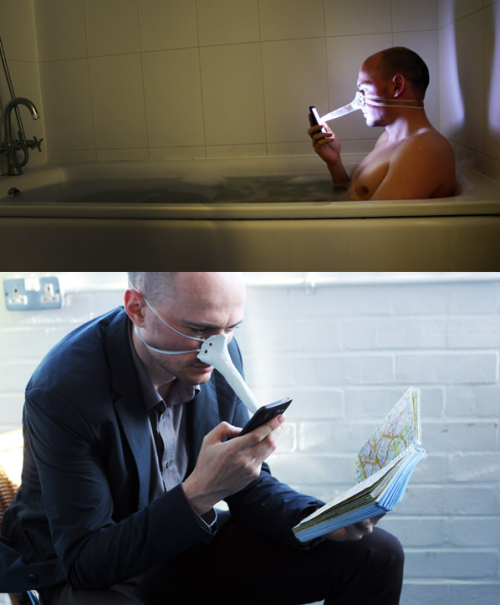 Ok, humour me for a moment, and imagine that it’s rush hour, and you’re on a crowded subway train, and you see that all around you are men and women dressed in pressed business suits wearing these face masks, nodding at their smart phones… That thought really made me chuckle when I first spotted the face mask stylus on Inspire Me Now.